I’ve struggled this year with how to occupy Owen and Cora while Maddy does her homework, and what I’ve come to realize is that in order for me to support Maddy, Owen and Cora have to pretend they’re in Rome and do as the Romans do. So after we get home from picking Maddy up from school, we get organized, clean up, have a snack, and we do homework. All of us. Maddy, Owen, and Cora. It’s become our after-school job. It takes a bit of prep on my part–not much–but it’s worth it. I felt like it just wasn’t fair to plop Owen and Cora in front of the tv while Maddy worked, and that Owen and Cora could both actually benefit from 20-30 minutes of quiet work time. Next year in Kindergarten, Owen will have a bit of after school work to do, and the following year Cora will. There’s no harm in starting the pattern one year early, right? Some ‘homework time’ activities have worked well, and some things have totally bombed. 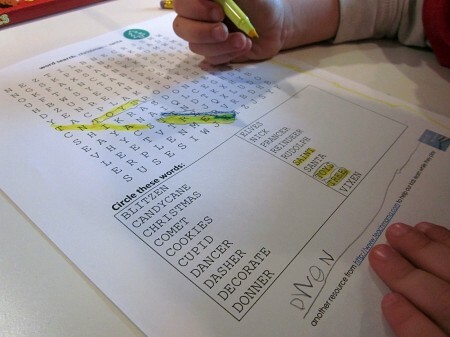 One thing that Owen really loves is a made-just-for-him Word Search. 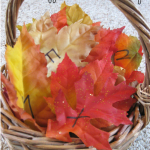 And thanks to Discovery Education’s puzzlemaker, he’s got a ton to choose from! 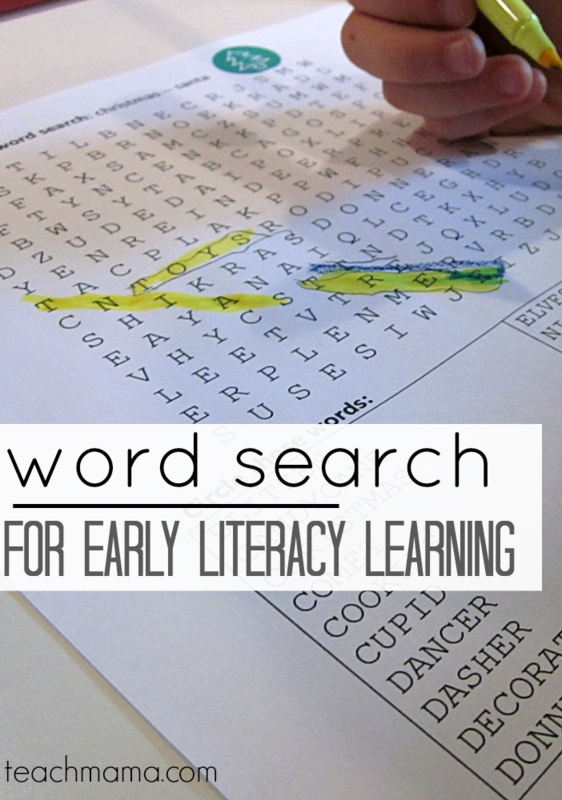 Word Searches, Word Searching, Word Finds: It took me all of five seconds to fall hard for Puzzlemaker, which I found thanks to Maddy’s teachers and the Fun Ways to Learn Spelling Words post. Owen has always loved Word Searches, and even before he was able to search for words, we ‘revamped’ his Spiderman Activity Book so that he could play with the Word Searches way back when. 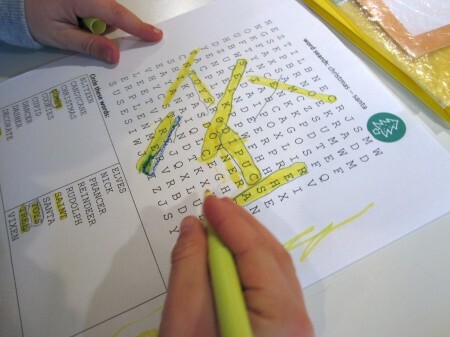 Owen likes to highlight the words on his Word Searches. 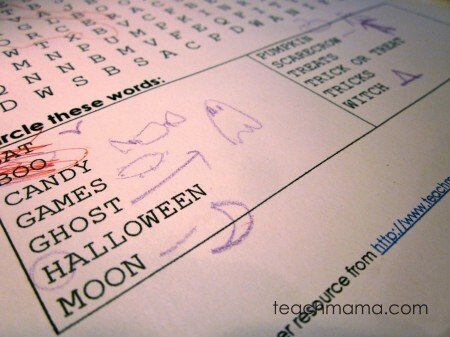 So the very first time way back in the fall when I brought out the Family Word Search for Owen to do during homework time, he was really, really happy. 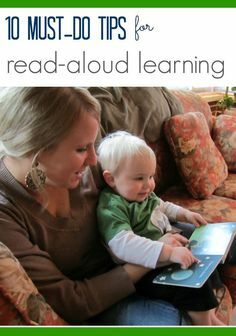 I have often touted the power of names in early literacy, so when he was able to actually read many of the family names that he was searching for he was over the moon excited. The Word Searches require me reading the list of words to Owen before he begins. I read and point to each word as I go. Initially I helped him get started; I’d run my finger along the top line, looking for the first letter of the first word to be found. If we found it, we’d go back to the word and check out the second letter. If we could find that second letter next to the first, we’d look for the third letter, and so on; if not, we’d move to the second line of letters. Over the last few months,, I’ve created a ton of Word Searches for him, and every few days, he’ll pick one up, finish it–or not–or clip it on the board to finish when he’s up for it. I try to keep them in a Word Search folder, easy-to-reach and labeled so he knows where they are if he wants one. 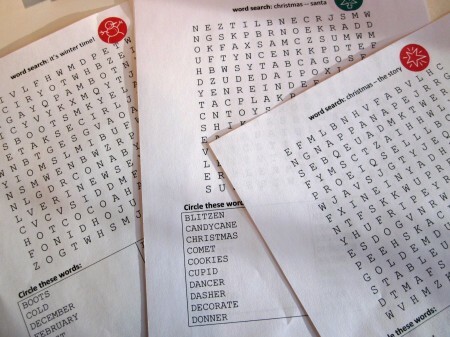 The Word Searches I’ve created this year, thanks to Puzzlemaker–are below as pdf’s to download and print out. I will add to this list as Word Searches are created. Most days, we do more interactive, directed activities with Owen and Cora before their rest time, but the ‘homework’ time really has to allow me to sit with and chat–uninterrupted–with Maddy. I’ve found that our day rolls more smoothly when homework is finished right off the bat; we’re an early-to-bed family, so homework at 7:30 won’t work, and after dinner is the only time they get to hang with their dad. So that’s that–the first of a bunch of ‘homework time’ posts to come. 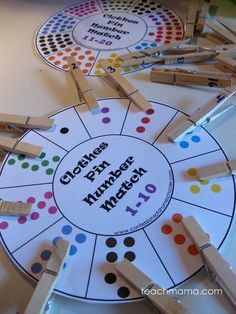 . . and a super-fun way of getting our emergent readers to practice their letter recognition and early literacy skills! Thanks for the word searches. I have a daughter in 1st grade and we do the same thing. We have two boys (4 and 2) who will go to kindergarten the year after next and the next one after that. Her homework time is their homework time. 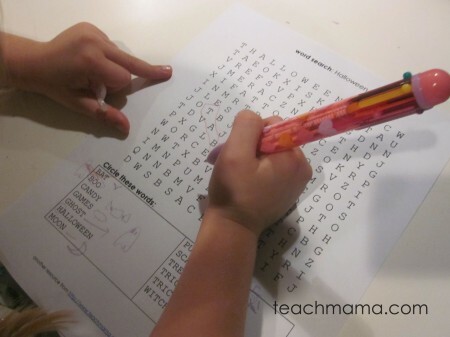 My oldest boy enjoys word searches too and I was glad to see the emergent sight word sheet. 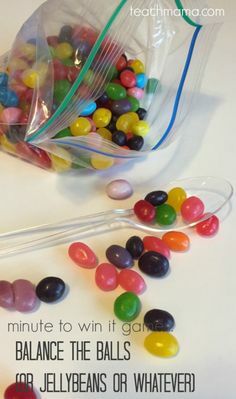 I homeschool the boys (along with the sweetest little girl) two days a week, but I always make sure to have quiet things for the boys to do at the table that focus on what we’re doing for the week in school. I do, however, give them the option of playing independently apart from each other in two different locations in the house if they want to. Sometimes my oldest will choose to play in his room with his Legos. Sometimes the youngest boy will choose to play with the Little People in the floor near us. AND sometimes, we even let them participate in her homework…like spelling games (amazing what a 2 year old can learn to “spell” just from playing a game! )…last night my daughter had a math game to play and we let the boys play. It took FOREVER to finish, but even my daughter noticed how much they were catching on by the end of it. Thank you again for these resources. I love coming to your site because you remind me so much of a friend I use to teach with (we live far apart now so we only get to catch up by phone occasionally). She has twins in first grade and she is absolutely adorable and loves to help others out…especially when it comes to educating children. She was the lead teacher at my school and her husband is a principal at another elem. school, so she loves anything educational like I do. Plus, she calls people “friend” like you do. Amy, this is a Godsend, thank you. I’ve been photocopying Emma’s homework for Noah because he wants to do it, but really he needed something that wouldn’t frustrate him yet still make him feel included…not to mention the fact that it’s frustrating for me to help him as he struggles to write sentences (which is incredibly beyond him) when really I should be working with Emma. Noah LOVES word searches. My printer is humming right now with the word searches you’ve created. THANK YOU! 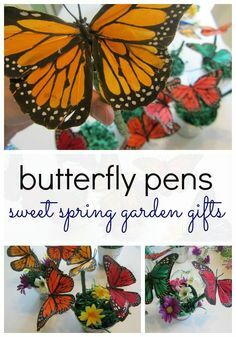 I love the idea of using the highlighter to mark the words, instead of circling them. 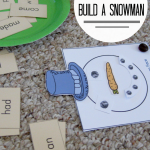 I’ll have to try these with my son’s (1st grade) sight words. Thank you! thank you SO much, Amy. Very kind of you to write! 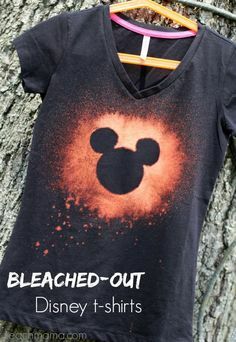 Different highlighter colors = much more fun!